STATEN ISLAND, N.Y. — ROSEBANK — Montalbano’s of Rosebank knows how to tempt customers at the family-owned store’s checkout counter: They present large platters of home-made Italian specialties right in your face. 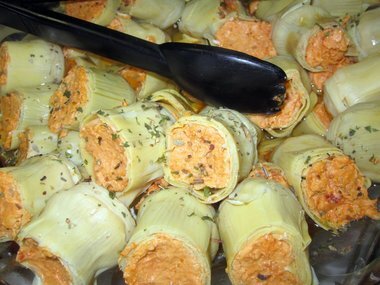 Diminutive artichoke hearts, stuffed with a combination of sun-dried tomatoes and imported Provolone cheese, blended into a creamy filling, are standout appetizers, guaranteed to impress ($10.99 a pound). “These are wonderful!” enthused Shore Acres resident Ruth Soren, after she was offered a complimentary taste recently. She immediately placed an order. The popular appetizer, made on the premises, is the culinary invention of Pat Parrelli, and his brothers, Cosmo Jr. and Vincenzo, whose family has owned and operated the Italian food specialty store since 2001.